Céad Míle Fáilte go Cumann Gaelach Knoxville! 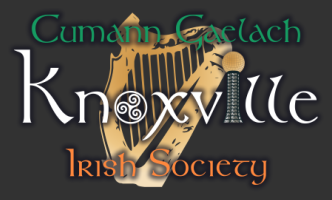 ​A Hundred Thousand Welcomes to the Knoxville Irish Society! Cé muidinne? Who Are We? Is eagraíocht nua muid faoi bhláth le baill as diaspóra na nGael agus daoine atá spéis acu in Éirinn sa ceantar Knoxville. We are a new and quickly-growing group of Irish diaspora and other Irish enthusiasts in the Knoxville area. Our events feature traditional music, Irish (Gaelic) language, culture, socializing, and other great craic (good times). Whether you are of Irish ancestry or not, we invite you to join us at any of our events and enjoy the company of others with an interest in the "Land of Saints and Scholars." Fáilte roimh cách! All are welcome! Here you will find an events calendar, instructions for how to join the Society and links to some of our favorite websites on Irish pop culture. Our website also provides an introduction to our hard-working board of directors and some information about Ireland and the Irish diaspora in Knoxville. Our online store, constitution and by-laws will be added to the website in the near future. Go raibh maith agat as cuairt a thabhairt ar ár suíomh gréasáin. Thank you for visiting our website. We hope to see you sometime and give you the famously warm Irish welcome!